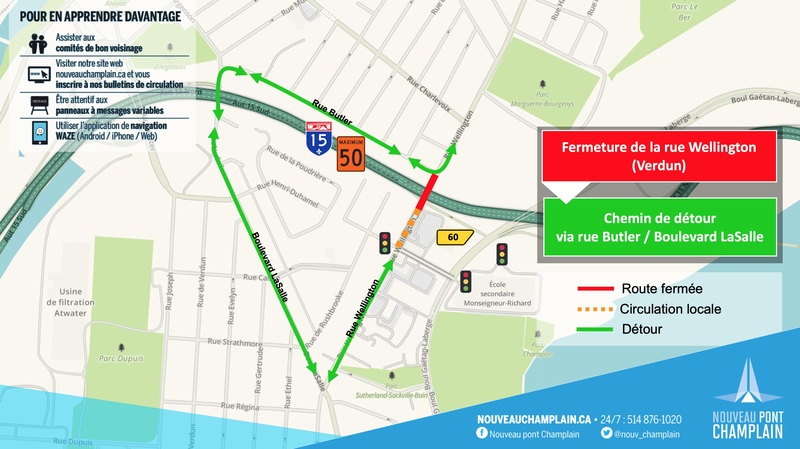 Signature on the Saint Lawrence (SSL) wishes to inform you that his team will be doing work, day and night, in the coming weeks to complete the overpass of the northbound direction of the Highway 15 over Wellington Street. Some work, requiring the complete closure of Wellington Street as well as the Highway 15 North lanes in the work area, will take place at night, from 10 pm to 7 am. This construction strategy will avoid disrupting traffic during rush hours. For example, from March 26 to 28, for three consecutive nights, from 10 pm to 5 am, SSL will install the girders of the future overpass. During this night work, Wellington Street will be closed between Gilberte Dubé (local traffic will be maintained) and Butler Street as well as Highway 15 North between Exit 60 and Atwater Entrance. The detour route for Wellington will take you to boul. LaSalle / D’Argenson Street. In terms of the noise generated by these night works, monitoring by our environmental team will be carried out to ensure compliance with the noise criteria included in the partnership agreement with the Government of Canada. SSL, however, does not anticipate exceeding the criteria and the chosen method of work allow to install the noisiest equipment as far as possible from the residential areas to mitigate the noises related to the work. Other short-term work requiring night road closures will be carried out, once a while, during the months of April and May. These closures will be communicated via our traffic alerts. Sign up for the following link: https://www.newchamplain.ca/newsletter/, if you have not already done so, to consult them.